Ever wonder how you can balance it all as a mom? This is one interview in a series talking to moms who have found a way to make it work. 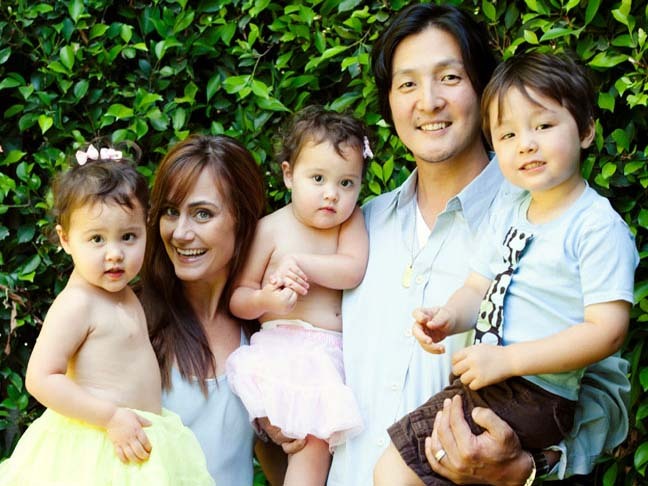 Meet Diane Farr, actress, writer and mom to Beckett (4), and twins Coco and Sawyer (2). When not hopping from city to city or doing a media blitz to promote her latest book, “Kissing Outside the Lines,” Diane Farr kicks back from the whirlwind of celebrity life by cleaning or listening to the babbling of her three little ones, only 16 months apart. That kind of old-fashioned stress relief is in sharp contrast to her glamorous Hollywood life with star roles on “Californication,” “Rescue Me,” “Numb3rs,” and MTV’s “Loveline.” These days, motherhood is her biggest challenge. Not one to let an opportunity pass, Diane has squeezed in another project – channeling her mommy frustrations and mishaps into entertaining fodder for her nationally syndicated newspaper column. With multiple balls in the air, Diane has become a master at juggling. I love when I’m really frustrated and I think I’m doing everything wrong and my kids will repeat something back to me that I didn’t even realize they were learning. Like, “Mom do you need a hug?” Or, they’ll ask me for lamb chops for dinner and I’m wowed because I’m trying to get them to eat all sorts of things. It’s those times I see my hard work paying off in the amazing people they are turning into. I enjoy everything about working. Sixteen hours on a set is like a walk in the park compared to 16 hours at home with three toddlers. The mentality is sometimes the same on the set, but there’s less chaos and crying. My biggest challenge is believing that any really difficult stage is actually going to end. It’s hard when I get to my boiling point, like when one of the kids is not sleeping or we’re on the seventh cold and I think I’m never going to get ahead of the sniffling. But spring always comes, for everything. By this point in my life you would think I would understand that things will pass, but phases like that just feel never ending. I found that the best support system is being with moms that have kids the same age. Talking to someone, not necessarily for advice, but who can tell me that they’ve been there or are going through it too, helps. I clean to calm down. Cleaning has become my western meditation. I move little things into shelves and containers. I’m not sure that it’s all that helpful, but it’s what I do when I’m stressed and at least I have a clean house afterward. I clean for the first 15 minutes and then figure out who I’m going to call because the best recharge is talking to my girlfriends. To only seek advice from other working moms. There’s a sort of ambitious angle to every job whether it’s teaching yoga, being a stay-at-home mom, working as a sculptor or in an office. Everyone working, in whatever capacity, finds their pride in it. Like, I may envy the moms who get to do the preschool pick up every day. But then I’ll have a week of preschool pick up and be losing my mind. So, it’s best to seek advice from people who are in the place in life you’d like to be because they will give you the greatest guidance. I’d have to say that my grandmother who is 90 years old inspires me. She lived with us growing up and was like a third parent. My grandma was there when I needed someone to just listen. I really try to take a lot of what I learned from her and do it with my own kids. I make sure to spend time hugging and kissing and talking with them. I make room in my parenting style to just be there in case they have something to bring up, rather than always pushing an agenda or trying to teach. A couple of months ago I would have said my Blackberry but now I’m trying to kick my Blackberry habit. Although I talk about how I mess up in parenting and fantasize about how much easier it would be to only have one child or just two or at least not all three within 16 months, I really couldn’t live without them. I’d waste the first 15 minutes cleaning and trying to get my head on straight. I’d spend the next 30 minutes getting stuff done around the house. In the last 15 minutes I would start thinking about what to do for myself. Time alone at home just feels like a chance to get things scratched off the list. It would take me a full 45 minutes to realize that life is not about “the list.” On a good day, after wasting an hour of me time, I might fight for 30 more minutes and actually sit in the chair and read something just for me.